Volunteers and their local counterparts complete an activity at a training together. Through our partnership with the Ministry of Health in Botswana, our volunteers serve in health facilities throughout the country. 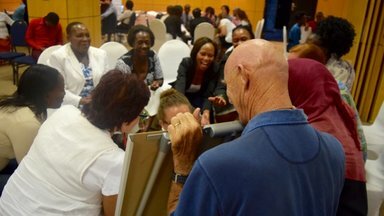 Through our partnership with MLGRD in Botswana, our volunteers serve in local government offices, building the capacity of District AIDS Coordination and Social Work and Development offices throughout the country. Through our partnership with MOESD in Botswana, our volunteers serve in schools of all levels throughout the country. We work with PEPFAR to provide HIV/AIDS prevention and treatment interventions across the country. Peace Corps works in close collaboration with NACA, as it coordinates the nation's response to HIV.